Manuals: How often do they disappear at the bottom of a drawer, unused? If you want to prevent that, there are a few essential steps to follow. It may seem logical, and that’s probably why it happens so often. Many organizations still have their central compliance department create their quality manual. To obtain information about all the process steps, a quality manager or Lean professional interviews various people in the organization, after which this manager then retreats to a corner to write the quality manual. Or teams work together in a Brown Paper session – a work group with yellow sticky notes on a large sheet of paper with the goal of documenting all processes – after which an advisor uses it to draw a process map. These are undoubtedly all well-meant attempts to arrive at a complete process manual. But by working in this manner, organizations still miss the mark. After all, the result is a manual with process descriptions that don’t match what is actually happening on the work floor. Which results in a significant compliance risk and a manual that goes unused. But it can be done differently. For mapping processes, whether it’s for compliance or process improvement, collaboration with the team is essential. This has a number of reasons. It won’t surprise anyone that team acceptance is incredibly low when the processes are drawn by only one person. But by going around the table with the team, and having colleagues draw and thus become owner of their own process, acceptance magically develops. But why hold on to brown paper? 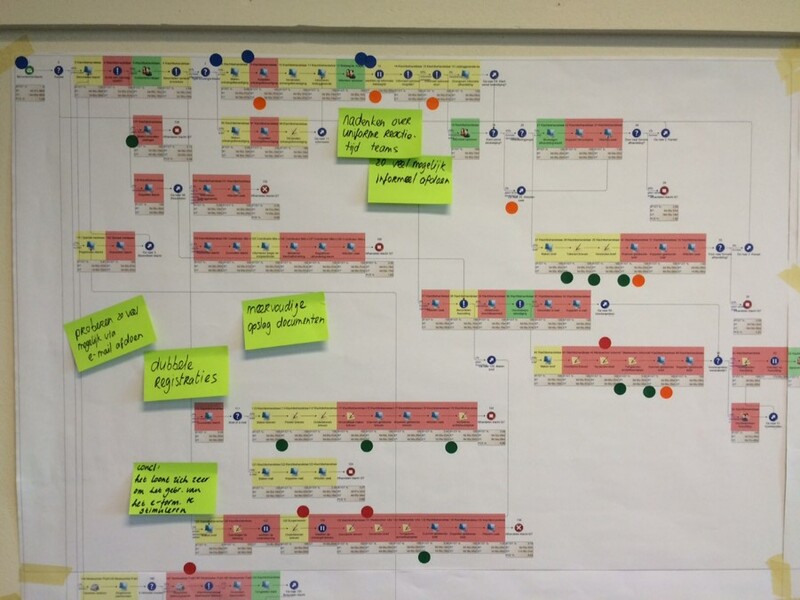 Specialized process workshop tools allow you to map processes real time and interactively with the team. The acceptance and ownership will then be optimal. Many work processes have exceptions. What’s more, the sum of all exceptions is often greater than the number of requests without an exception. Teams often know like no other how their process actually works, especially when it comes to all the exceptions. So for a correct process description, you must ask the team about these exceptions and include them in the description. When processes have not been discussed and mapped with strong team involvement for some time, it seems that employees often know little about tasks done by their colleagues. Such a process workshop creates not only better team spirit (colleagues become team players instead of functional experts), but it also often allows low-hanging fruit to be easily identified. Problems for which, many times, there are easy and pragmatic improvements. What are you going to do in your organization the next time you start working on a process manual?